Enjoy it with a couple of blocks of ice to bring out the fruity flavours locked inside. A while back I was lucky enough to be taken on a tour of the Scottish highland distilleries, and over those few days I drank more whisky than one person should be allowed to in their life. It was only when I flew back to South Africa that I began to really appreciate the dedication of Scottish whisky distillers. And with a new found appreciation for the fire water, I began testing the various Scottish whiskys on offer. Then the Singleton made the claim that it was the best stating single malt whisky in the world, and stated that I should test this and decide for myself. So I did, and here’s my view. It takes a bit of an understanding about whisky to be able to develop a clear view on what influences if it is the best or not. I prefer to first understand the history and positioning of each before I come to a conclusion if it is the best. You may well say that I shouldn’t, as the claim is based on the taste alone, and yes, it would be perfectly acceptable to line up a bunch of whiskys and have a drink off to decide which is the best. And if that is the way you want to go, then by all means, but nonetheless, here is a quick rundown. Okay, so if you walk into any bottle store, you will no doubt see rows and rows of whiskys. So where do you start. Well, lets begin narrowing it down. While there are many whiskys from various parts of the world, it is pretty much accepted that the place you need to go if you want to get to the heart of the matter is the UK, Scotland in particular, and specifically the Speyside region. the Speyside region is located in the very north of Scotland north of Edinburgh and west of Aberdeen. Here, dotted all along the countryside are various distilleries, home to such whiskys as the Jonnie Walkers, the Glenlivet, the Cardhu, the Glen Grant, the Glenfiddich and, of course the Singleton. And while the Irish may put on a strong showing, the Scottish regularly beat them hands down on producing the finest whiskys time and time again. 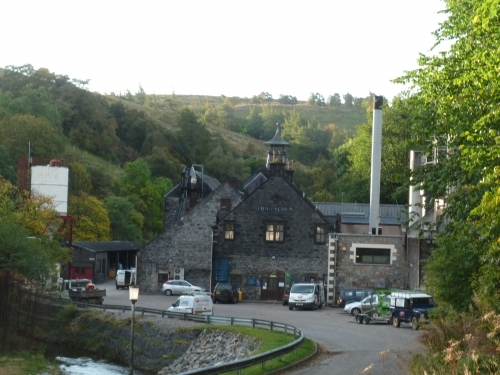 A view of the Dufftown Distillery where the Singleton is made. So, then to look at the blends vs the single malts. As is suggested, the blends are those whisky’s that are created through the meticulous blending processes of various whiskys that each bring their unique flavour and notes to the final product. The single malts are not blends, but whiskey’s that have been produced at a single distillery and which relies on the processes and ingredients for its taste. So which the blends bring together whiskys to develop then end note, the single malts depend on what flavours are hidden in the barley and the oak maturing casks. So, if you are wondering, Jonnie Walkers are all blends, while the Singelton, Glenlivet and Glenfiddich and Glen Grant are all single malts. So, cross off Jonnie Walker Blue or Black if you were thinking about testing it against the Singleton. It would be the same as comparing Nectarines and Oranges. 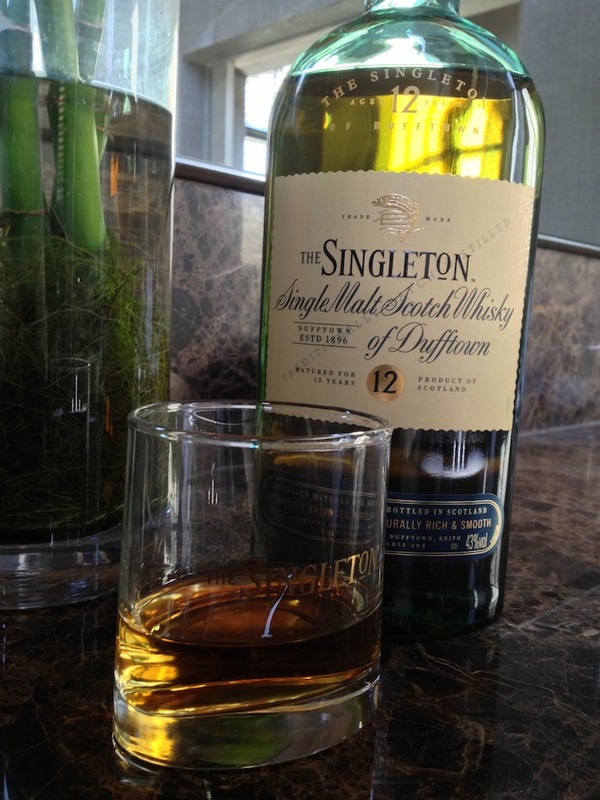 The Singleton of Dufftown 12 years old is made with care and attention. Its deep golden colour, notes of toasted nuts, rich fruit and brown sugar, and hints of espresso, this smooth, naturally rich Speyside single malt whisky leaves you with a lingering, pleasurable warmth. Personally, I enjoy my whisky with a burst of water to open the notes allowing for the fruity flavours to come out. It is also far more drinkable than a neat whisky, or alternatively, drop two blocks of ice in the glass to allow for the whisky to open its flavours over a longer period of time. The first taste would be a stronger note, but becoming far smoother as the ice melts, until the last sip presents a week hint of the original note, which often entices one to pour another glass. 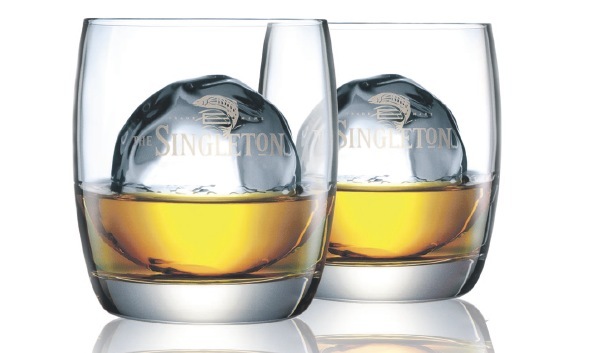 As a progressive whisky that is passionate about craftsmanship and great taste, Singleton celebrates the sensorial experience it offers by enhancing the tasting notes with complementary foods. Its deliciously smooth taste goes well with chocolate pralines, which bring out the nutty notes; and veal dumplings, accompanied by an apple-sauce, enhance the fruity notes. To further enjoy the flavor-rich taste of Singleotn, try pairing it with either crème brulee, smoked salmon on pumpernickel bread and pickled ginger, or salt and pepper prawns. So, is it the best tasting single malt whiskey in the world? I have no idea, and I am sure that there are various other whiskys that are also brilliant. But I think that the intention is not for you to decide now, but to begin the path of discovering whisky for yourself. And like the Scottish, take it slowly, be adventurous, but treat it with the respect it deserves. You willb e quite surprised where your journey may take you. The Singleton is a great single malt whiskey to start you off, and will probably be one of the whiskys by your side when your journey ends.